Apple today released the fifth beta of iOS 9, and as with the previous iOS 9 betas, there are a few new features and tweaks bundled into the release. WiFi calling for AT&T users has been introduced and is coming soon, Apple's debuted several new wallpapers, and there are tweaks to CarPlay and the iPhone keyboard. Several bugs have been fixed in iOS 9 beta 5, and features like News and Siri Suggestions are working more smoothly than ever. With approximately a month and a half to go until release, iOS 9 is feeling faster, more polished, and more full featured. For those eager to know all about what's coming in iOS 9 ahead of its release, we've rounded up a complete list of the changes introduced with iOS 9 beta 5 below. You can also check out all of the changes, large and small, that have been made in previous betas: iOS 9 beta 1, iOS 9 beta 2, iOS 9 beta 3, iOS 9 beta 4. Wallpapers - Today's update includes a wide selection of new wallpapers, introducing images featuring close ups of feathers, flowers, plants, and more. Many older wallpapers have been removed, so people running iOS 8.4 should save their favorites now before they're deleted with the launch of iOS 9. 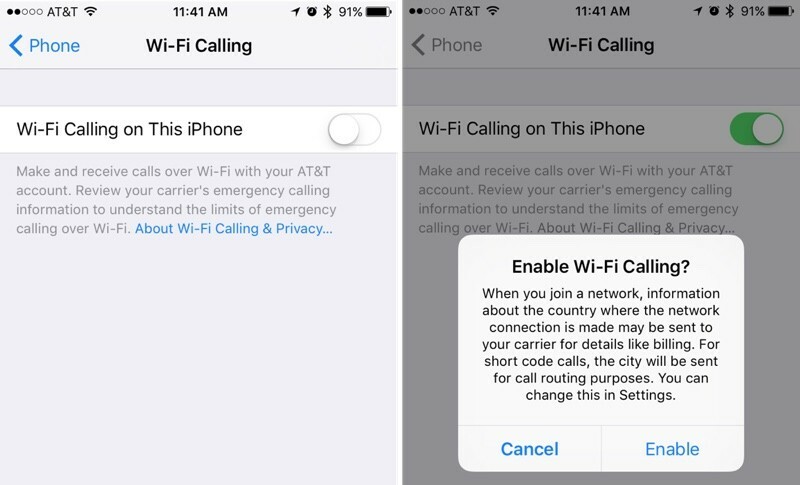 WiFi Calling for AT&T - Beta 5 adds WiFi calling options for AT&T subscribers, but attempting to turn the option on results in a message saying WiFi calling is not yet available. The addition of the setting heralds the imminent release of the feature for AT&T users. Previously, WiFi calling was limited to T-Mobile and Sprint. There's also a new WiFi Assist feature that will "automatically use cellular data when Wi-Fi connectivity is poor." Apple Music - There's a new "Shuffle All" option at the top of My Music when in Song, Album, or Genre view. It'll play all songs in a music library on shuffle mode. Keyboard tweaks - On the iPhone, the keyboard has been tweaked and simplified with new shift and backspace keys. Handoff - Handoff functionality has been changed in iOS 9 beta 5. Previously, Handoff had an option that would allow users to see lock screen suggestions for Apps in the App Store for a relevant location, but now only installed apps will be displayed. 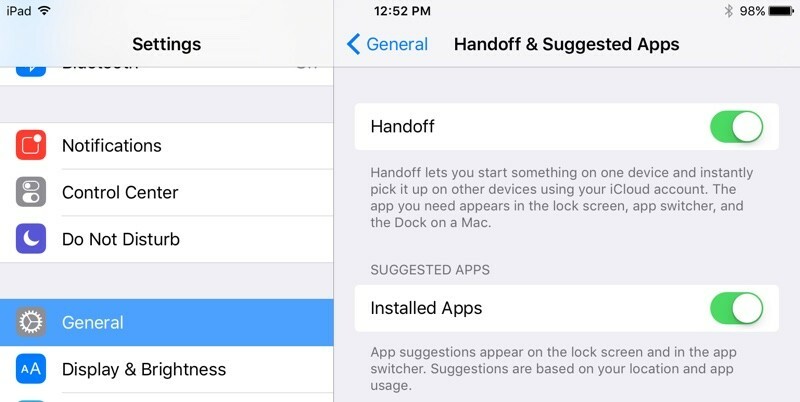 In the Settings app, Handoff options under General -> Handoff & Suggested Apps, the option to display App Store apps has been removed. 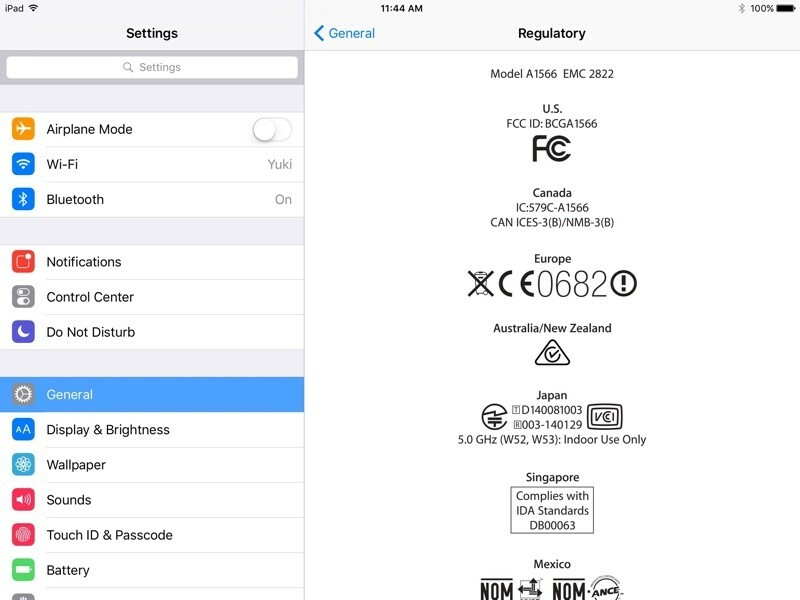 Regulatory info - The General portion of the Settings app has a new "Regulatory" section that displays regulatory information for iOS devices. This was information was previously hidden (and is still located) in General --> About --> Legal. CarPlay - The CarPlay interface has been updated, changing the way images are displayed behind music controls and adding the ability to heart songs that are playing through Beats 1 radio or Apple Music. Siri Suggestions - The Siri Suggestions interface has been tweaked slightly, removing the labels for calling and messaging a contact. Only icons are displayed now. Text Replacements - In the Settings app, the section where you can create shortcuts for keys has been renamed "Text Replacements." WiFi animation - There's a new animation that's used when WiFi is turned off. Instead of the bars disappearing one by one, the WiFi symbol now fades to gray before disappearing. Additional feature updates in iOS 9 beta 5 will be added here as they are discovered. Apple is expected to release at least one or two more update to iOS 9 before the operating system's official launch. iOS 9 is expected to be released to the public in the fall alongside new iPhones. New area showing size of iCloud photo upload size? Dear professional writer: "Apple's" is a possessive form, not a contraction of "Apple has". Should be: "Apple has debuted", or "Apple debuted" for short. Dear critic: The grammar is correct as written. Your only possible argument is that some deem it improper for formal writing. But the audience and the site's purpose must be considered. A site called Mac Rumors may employ informal writing at its discretion. So, who thinks AT&T will once again try to force customers to give up their unlimited data plans by limiting Wi-Fi calling to those on their tiered data plans? "automatically use cellular data when Wi-Fi connectivity is poor." I have a feeling new iPhones may not ship with FCC labels anymore. Also, those new wallpapers with a black background would look nice on an OLED panel (Force Touch = flexible OLED if it's anything like the Apple Watch). 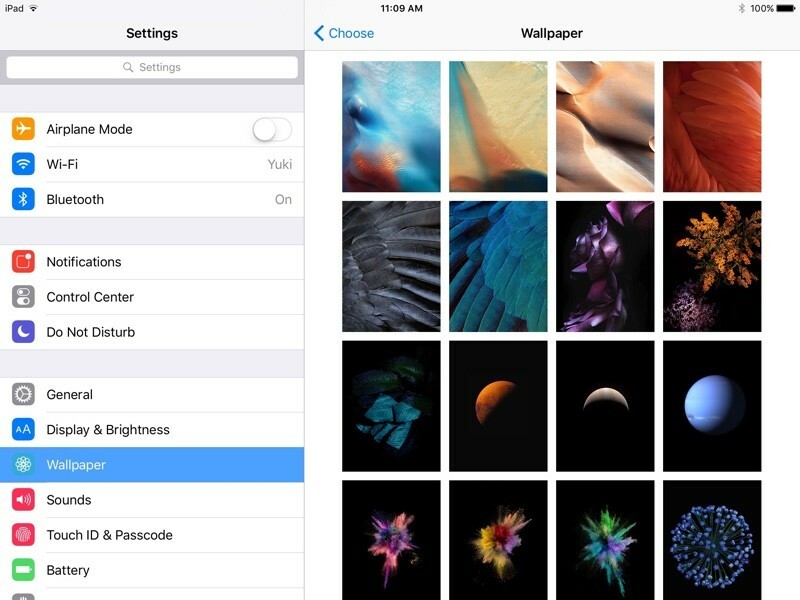 Finally they realized that those piss poor wallpapers in iOS 8 needed a worthy replacement. Kind of off-topic, but several years ago Apple announced a feature of the then-new iOS version which was supposed to fall back to your cellular data connection when your wifi connection was weak. I'm surprised that with a modern iPhone and iOS 8 I still have problems where I'm connected to a weak wifi signal and my phone don't fall back to my five bars of LTE coverage. Hoping that feature eventually comes for internet usage too. Do people really care any more about Wallpapers? I have never used an apple wallpaper. This use to be a cool feature years ago but people just use photos of what they want not some generic wallpaper. I don't get the fascination every time Apple announces a new wallpaper. Seems resources could have been applied elsewhere. Maybe one day they will figure out how to not force icon auto arranging to the top of each page so keep them at the bottom of the pages so you don't have to do the super reach or touchy/glitchy double home button click to reach an icon. And I can see more of the wallpaper even better lets have a large clock/weather widget type option to fill that space. Oh and let people change default notification sounds for third party apps. Such simple tweaks that would make a big difference in user experience. Well at least for me. I still think iOs is due for a huge ui restructure. It's still easy to use but not as quick and efficient to use as I would like it to be. iOs 6 jailbroken was my favorite smartphone experience.